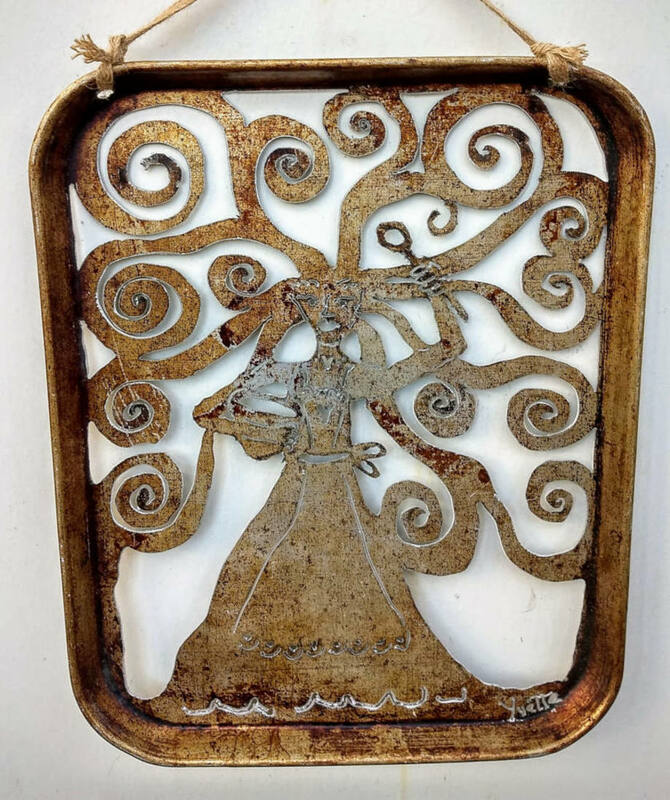 Baking goddess design hand-cut into an aluminum cookie sheet. Measures 18 x 26". 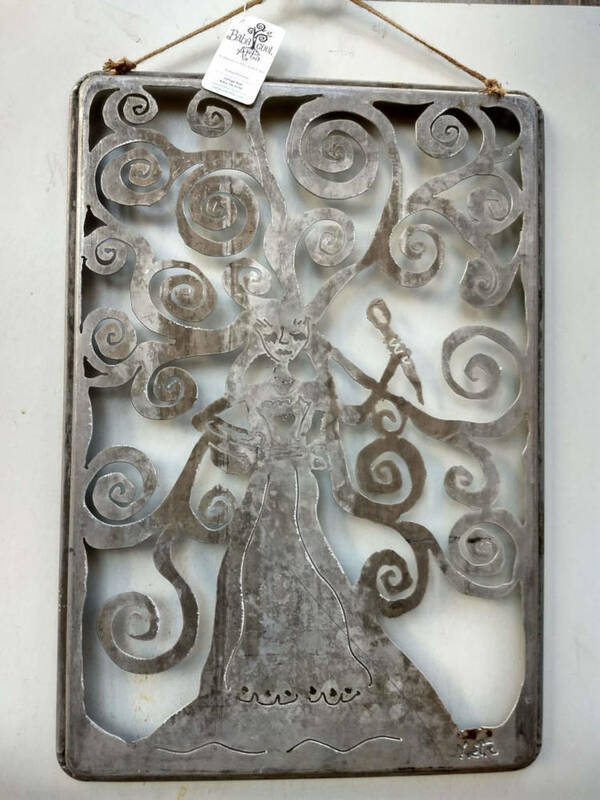 Baking goddess design hand-cut into a cookie sheet with a plasma cutter. Measures 14 x 18". 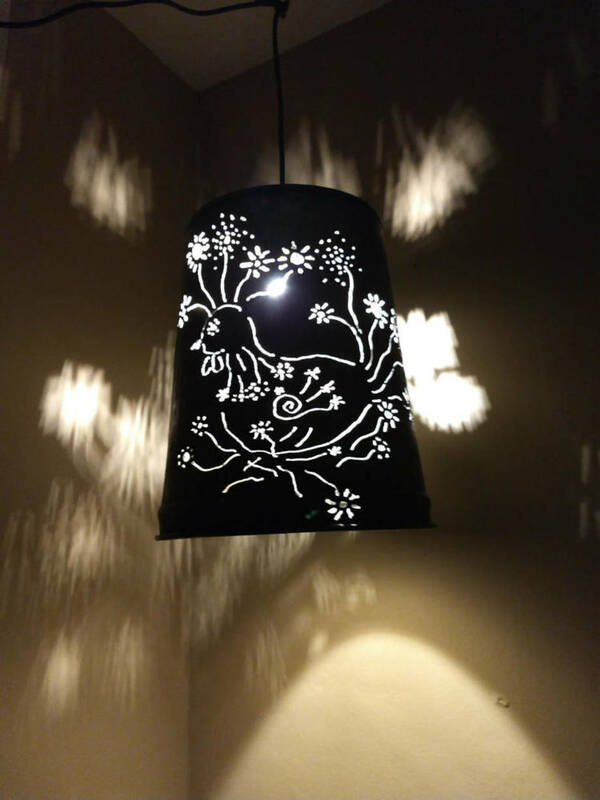 Design hand-cut into steel pieces and assembled together. 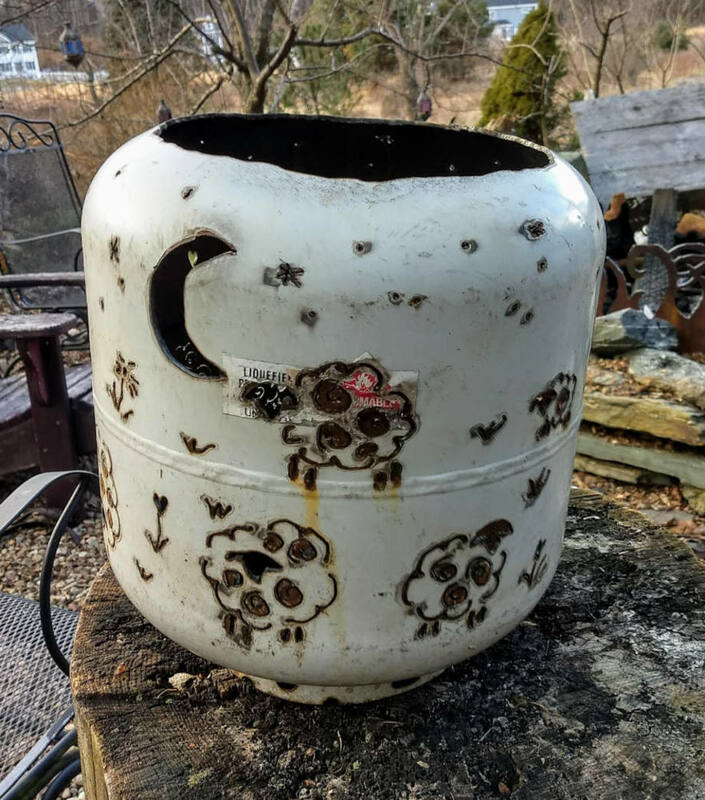 Measures 23 x 32"
Sheep under the moon design hand-cut into a recycled propane tank with a plasma cutter. 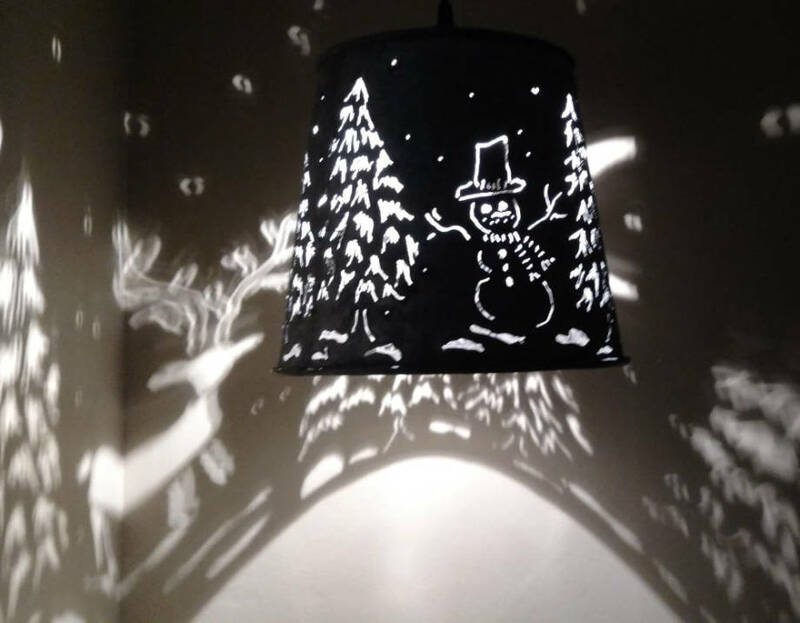 Comes with an outdoor torch candle. 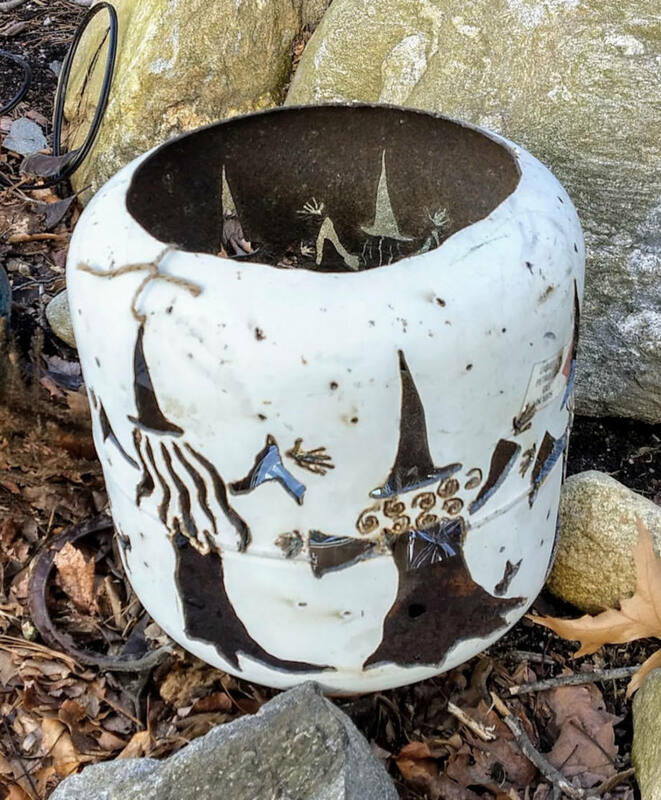 Witches dance design hand-cut into a recycled propane tank with a plasma cutter. 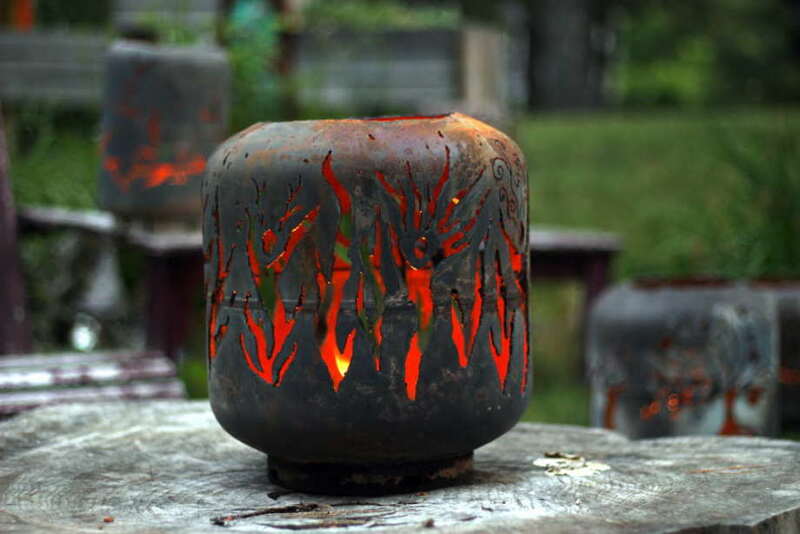 Comes with an outdoor torch candle. 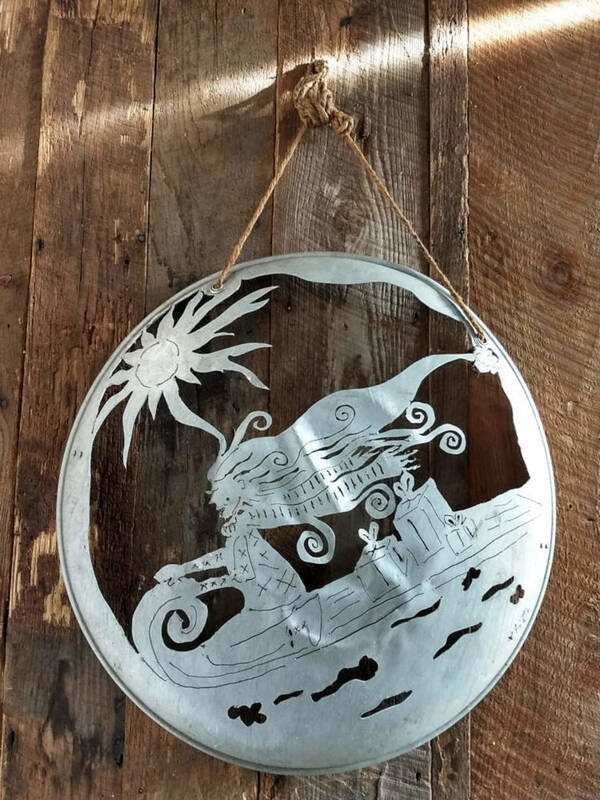 Design hand-cut into a aluminum saucer sled. Measures approx. 32" diameter. 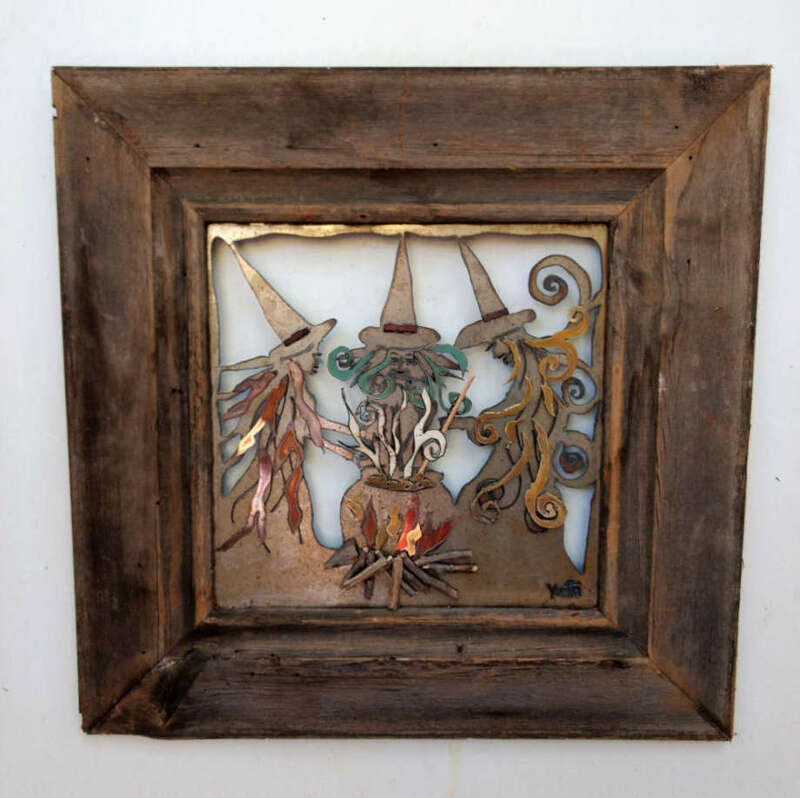 Three witches around cauldron design in steel, with colored metal and wood accents. Measures 24" x 24". 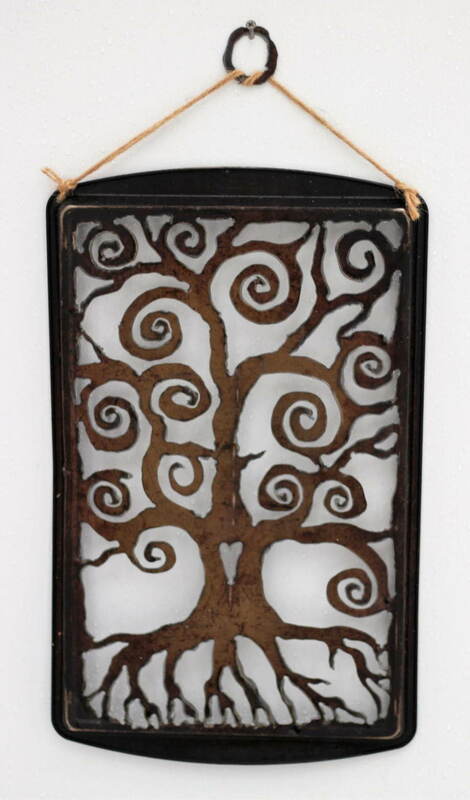 Design hand-cut into steel and welded together. Measures approx. 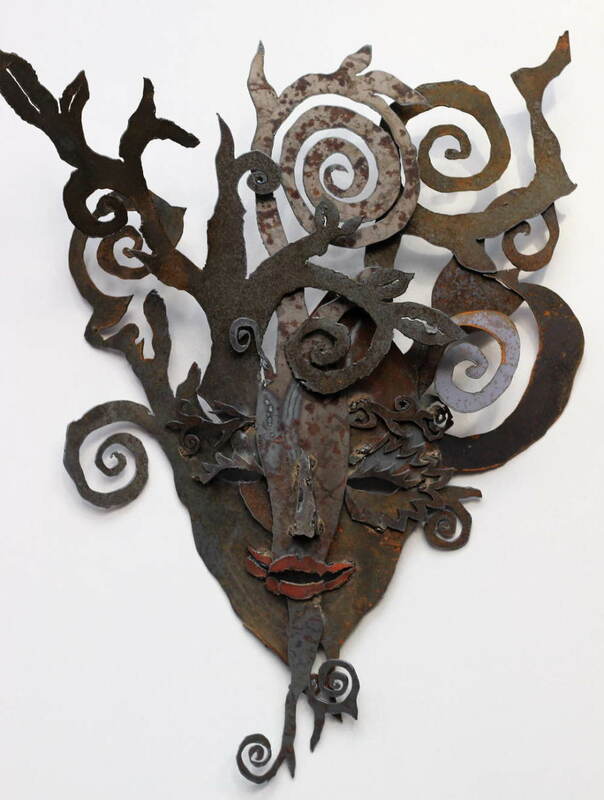 30" x 36"
Mask out of an old wheelbarrow. 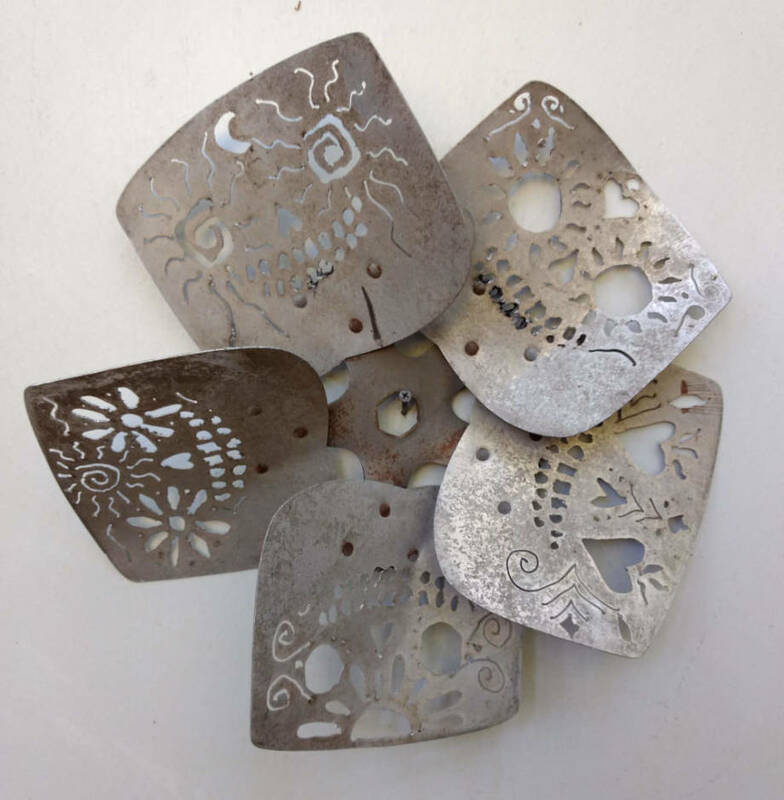 Design elements hand-cut out of steel with a plasma cutter. Measures approx. 38" x 44". 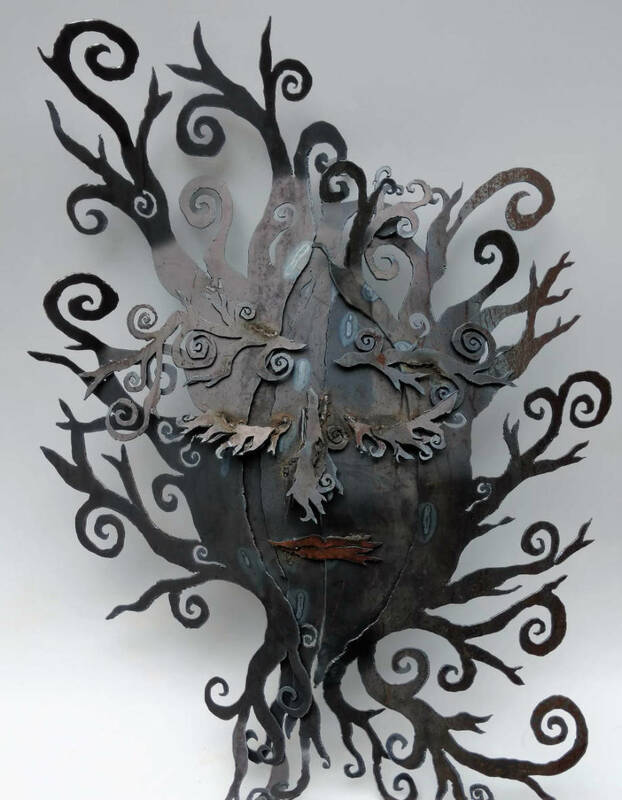 Mask created out of pieces of steel hand cut with a plasma cutter and welded together. Measures 34" x 44". Steel and stainless steel. 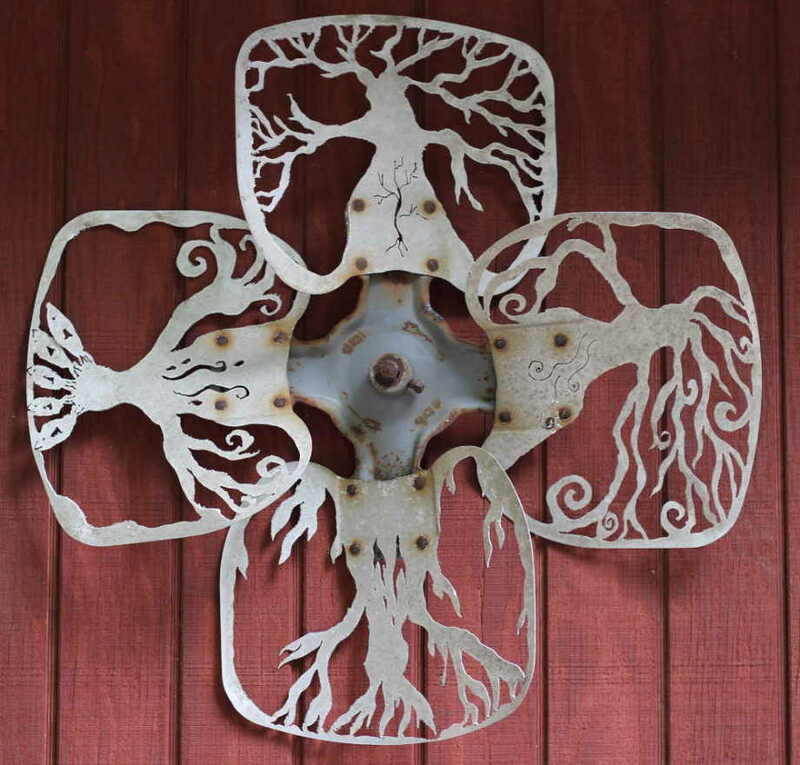 Design hand cut into steel, painted, and stainless steel and other accents added. Measures approx. 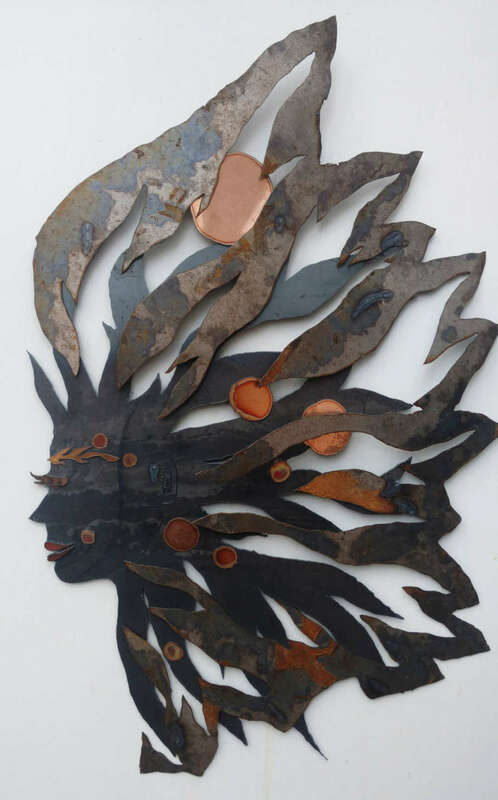 36" x 20"
Steel, copper, and aluminum. 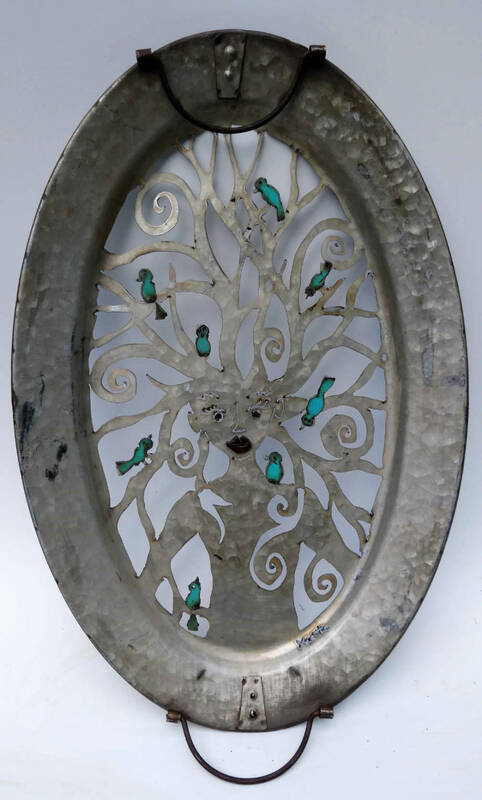 Design hand-cut into steel, painted and aluminum and copper pieces added. Measure approx. 24" diameter. Steel and stainless steel. 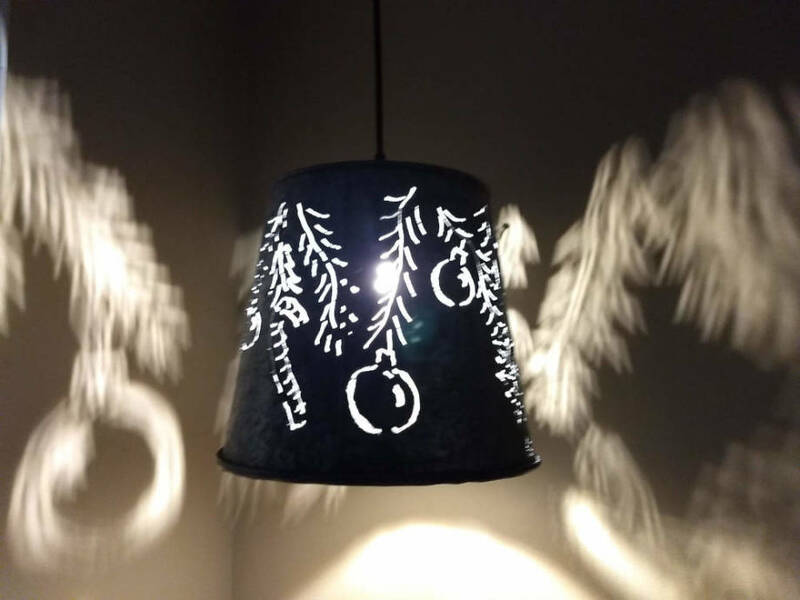 Design hand cut into steel, painted, and stainless steel and other accents added. Measures approx. 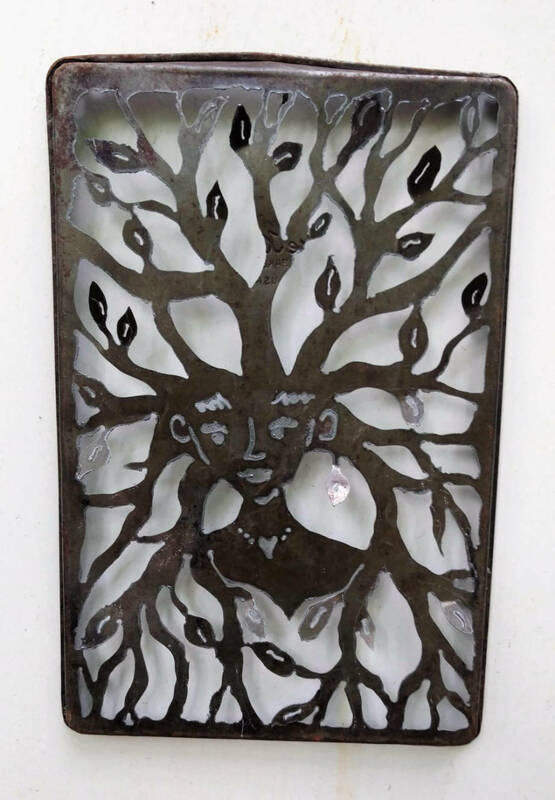 20" x 36"
Green man design in steel. 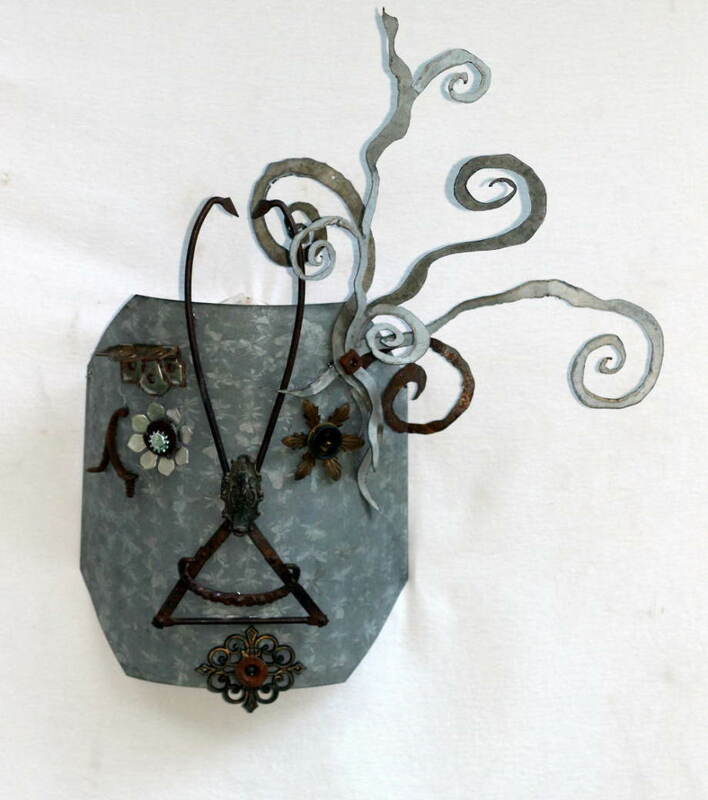 I hand-cut pieces of steel and welded them back together to form the mask. 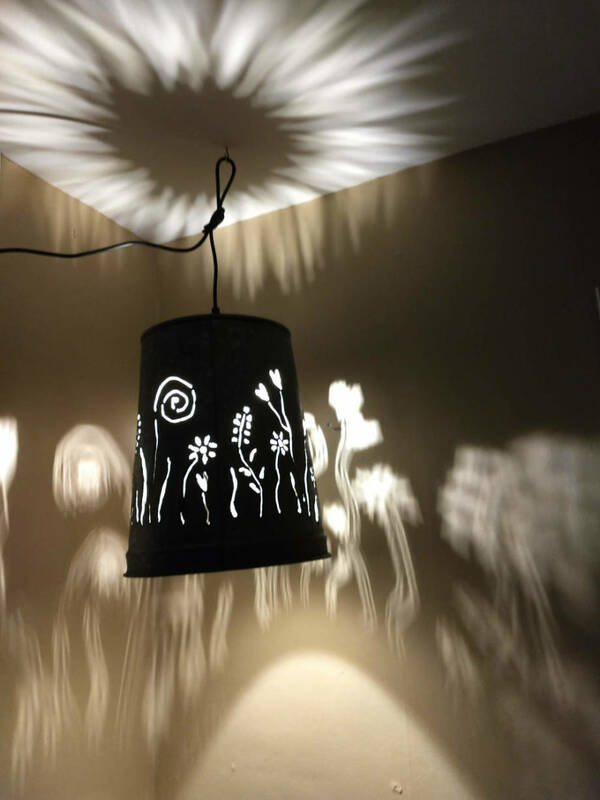 27" x 55" x 7"
Garden design hand-cut into a galvanized maple syrup bucket and convereted into a hanging lamp. 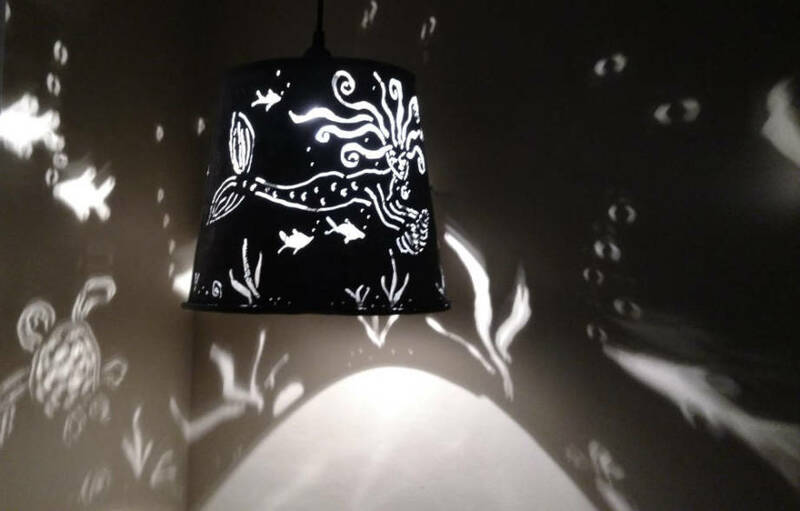 Mermaid underwater design hand-cut into a galvanized maple syrup bucket and converted into a hanging lamp. 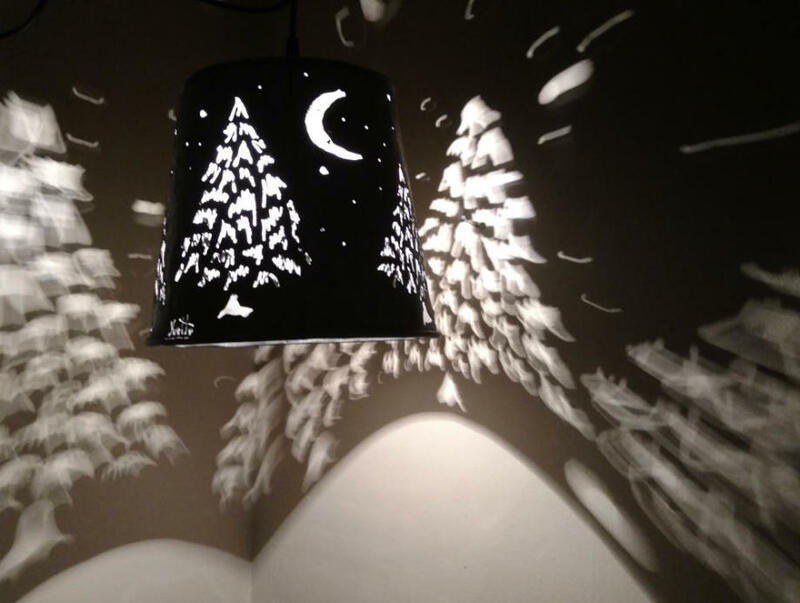 Plug-in lamp cord has switch, and LED bulb included. 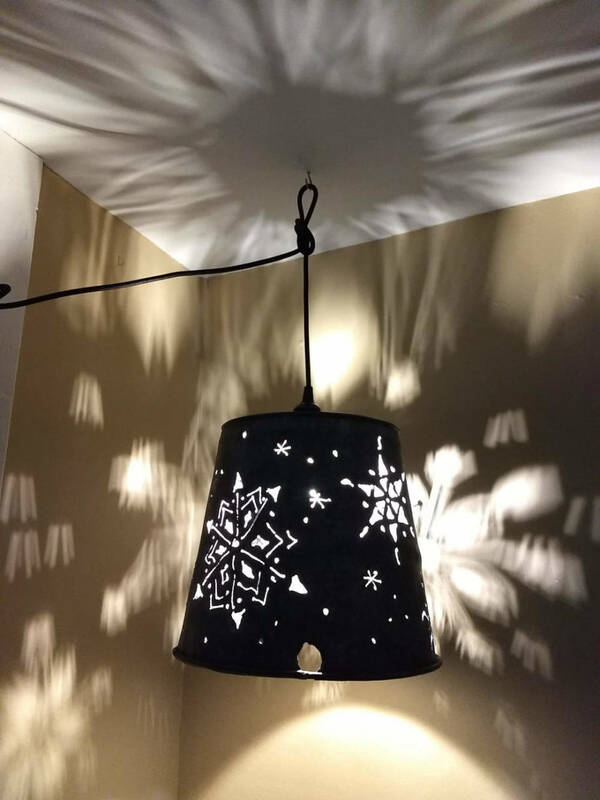 Snowflakes design hand-cut into a galvanized maple syrup bucket and converted into a hanging lamp. Plug-in lamp cord has switch, and LED bulb included. 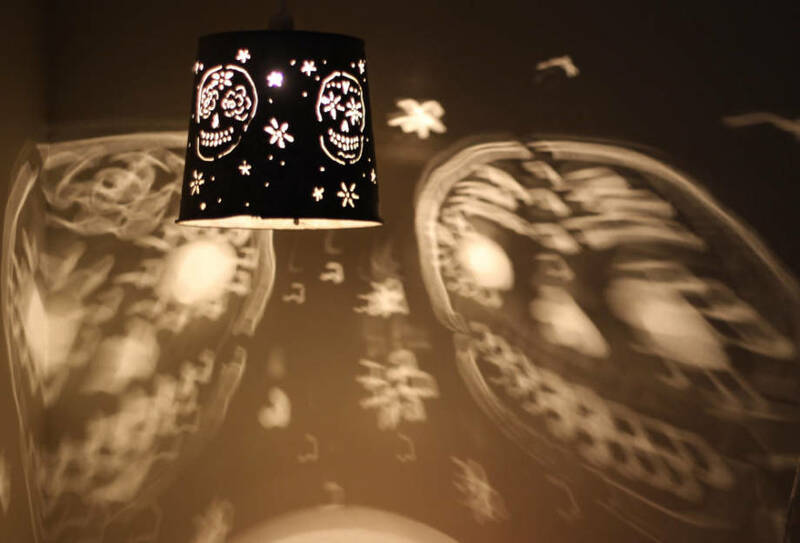 Holiday ornaments design hand-cut into a galvanized maple syrup bucket and converted into a hanging lamp. Plug-in lamp cord has switch, and LED bulb included. 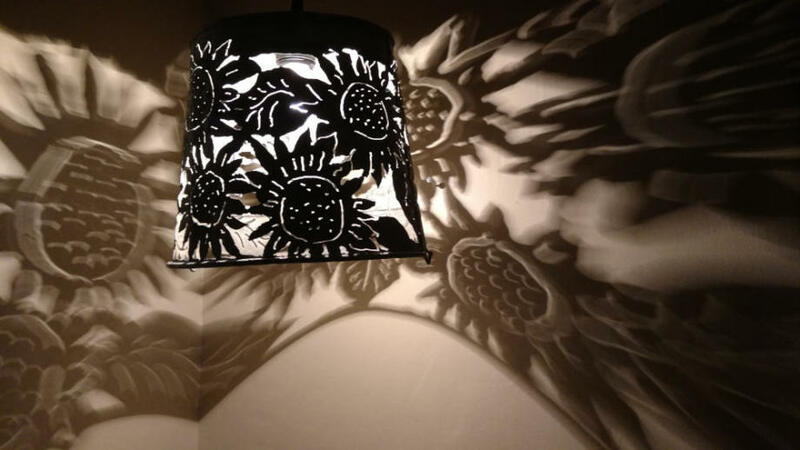 Sunflower design hand-cut into a galvanized maple syrup bucket and converted into a hanging lamp. Plug-in lamp cord has switch, and LED bulb included. 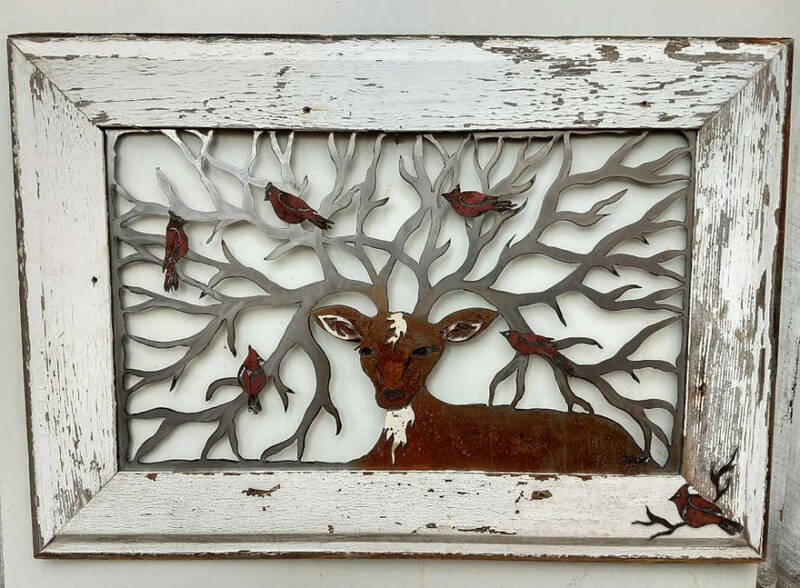 Stag with cardinals in antlers design, hand-cut with a plasma cutter, steel and barnwood. 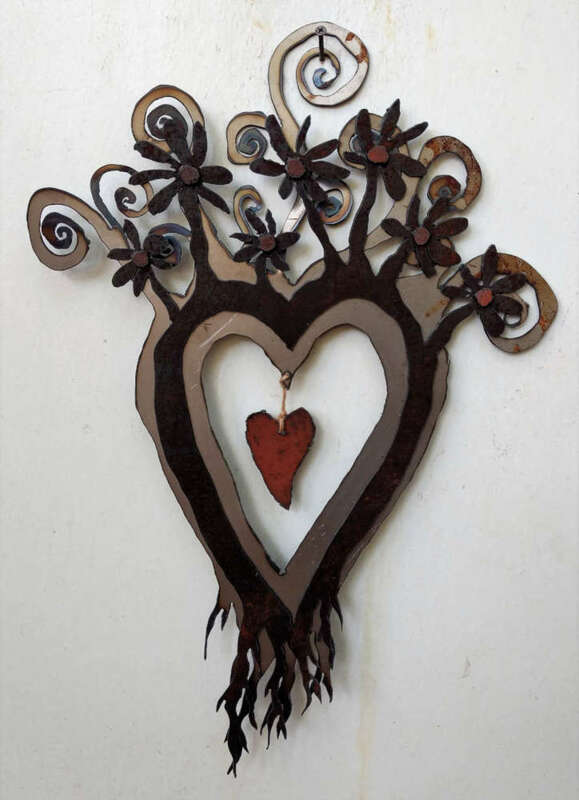 Measures 36" x 24"
Heart design hand-cut into steel pieces and assembled together. Measures approx. 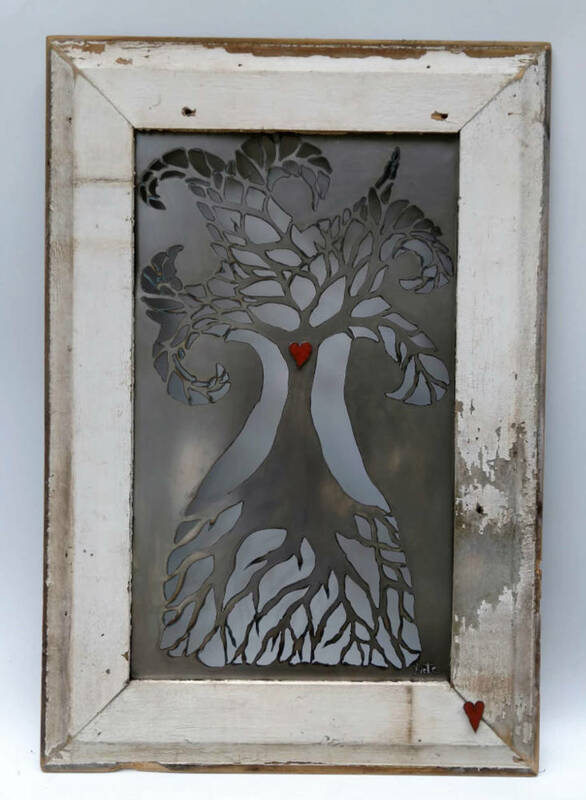 15 x 23"
Pieces of steel hand-cut with a plasma cutter and assembled together. Measures 24" x 24". 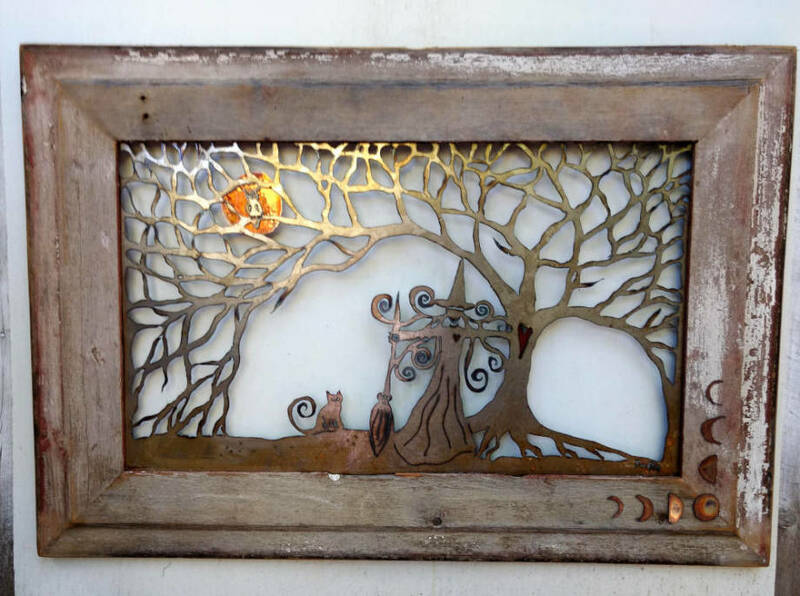 Design hand cut in steel, copper, and brass and assembled together in a barnwood frame. Measures 24" x 24". 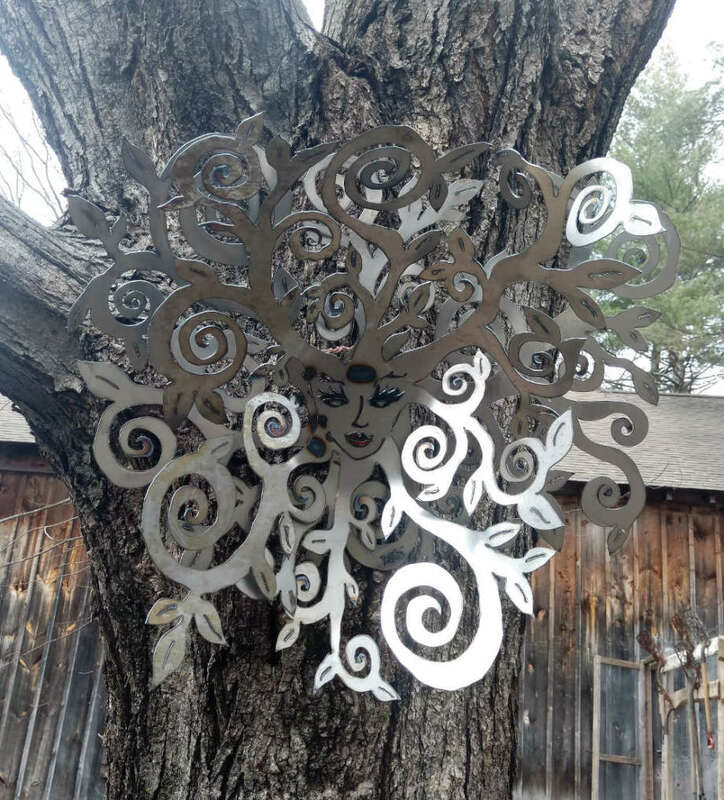 Steel pieces hand cut and assembled on old maple tree. 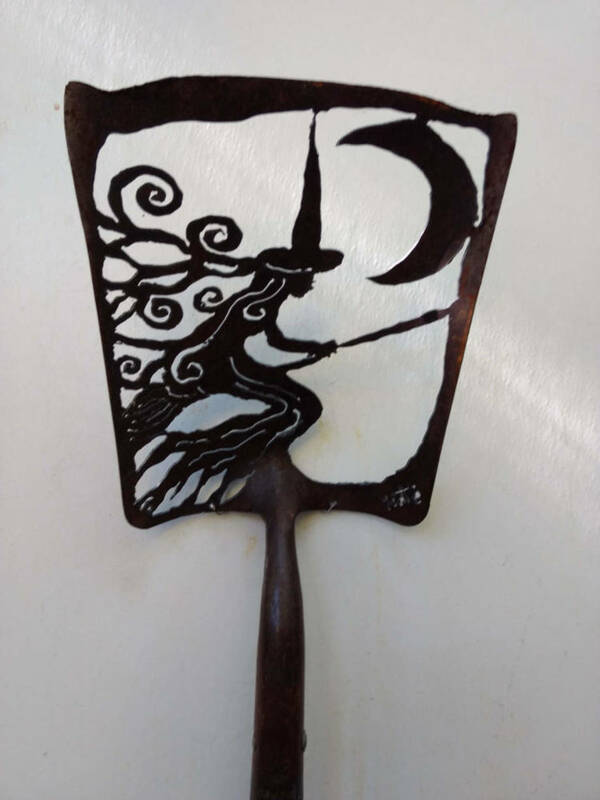 Flying witch design hand-cut into a shovel with a plasma cutter. 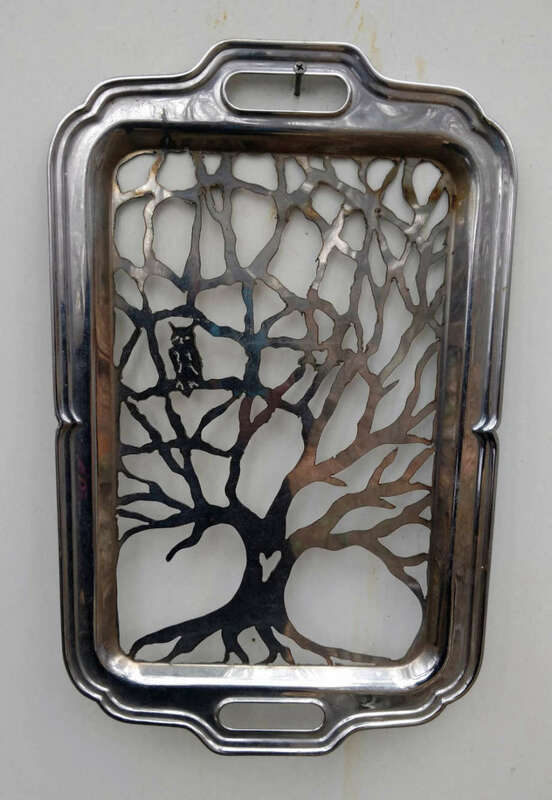 Design hand-cut into a cookie sheet with a plasma cutter. Measures 12 x 22. 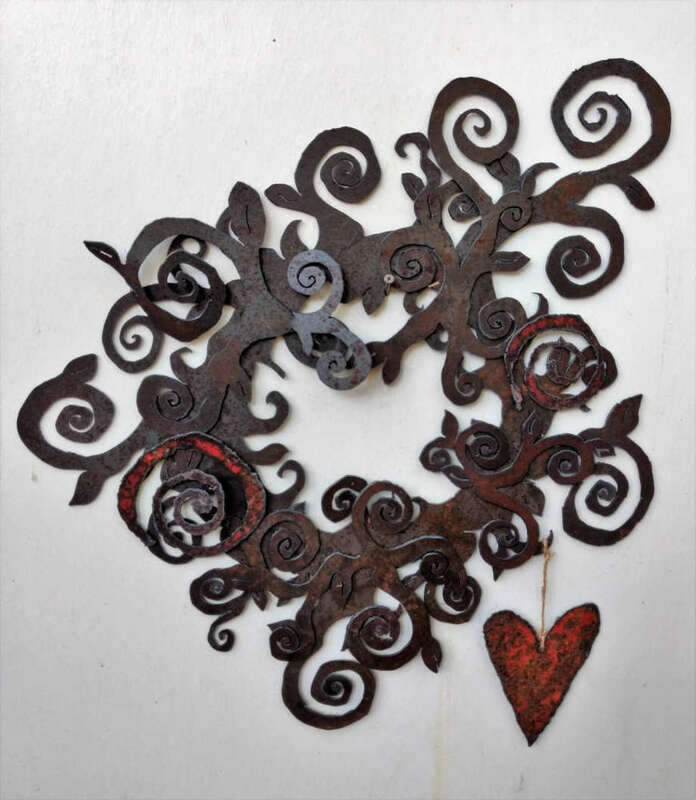 Hand-cut steel welded together with copper accents. 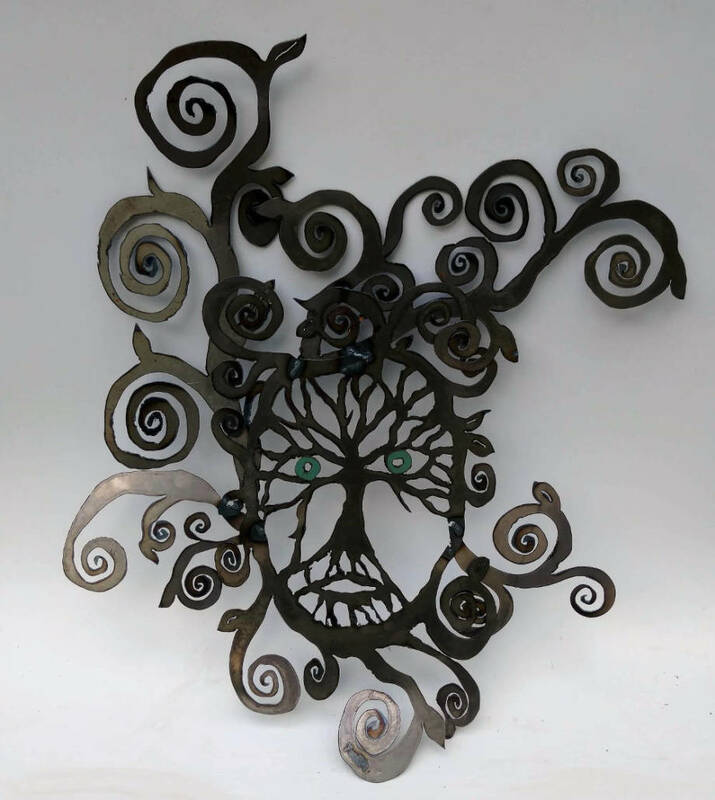 Measures 29" x 44.5"
Mother Nature design hand-cut into sheet steel and welded together. Red and blue accents (lips and eyes). 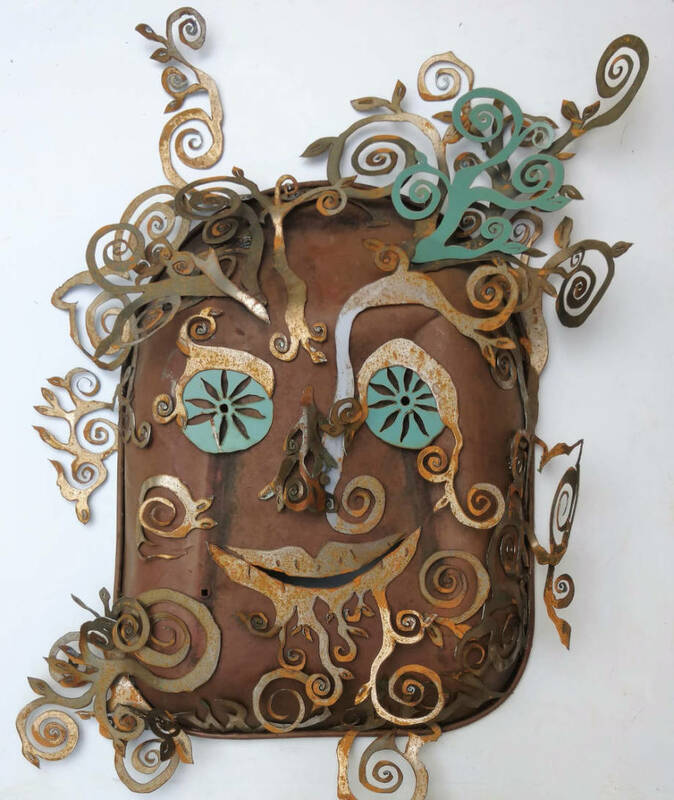 Face has been treated to resist rust, whereas the branchy hair will rust if outside. 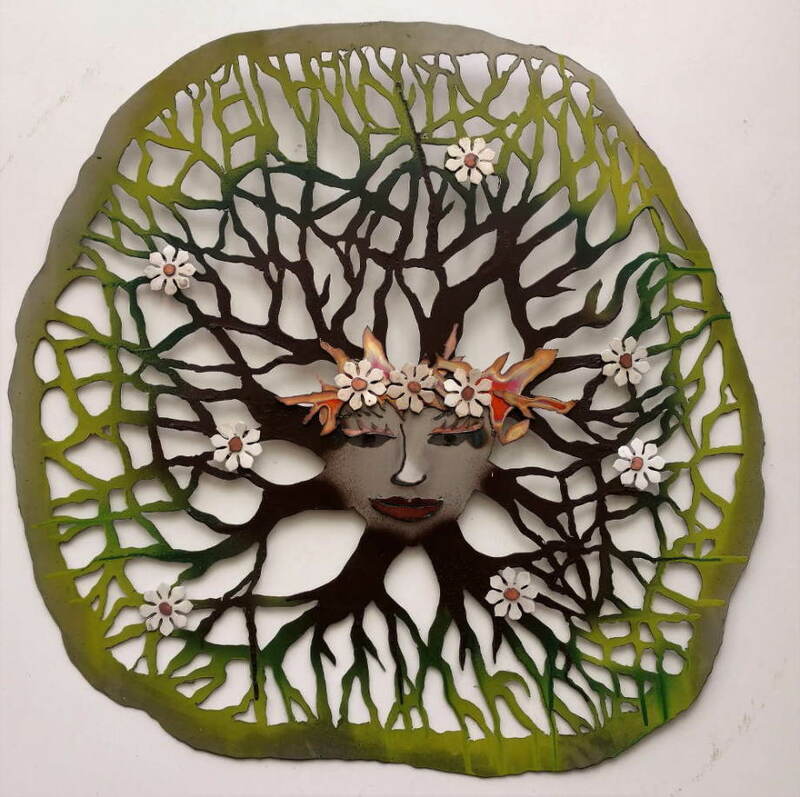 29" x 30" - 3D so branchy hair can be twisted pulled outward. 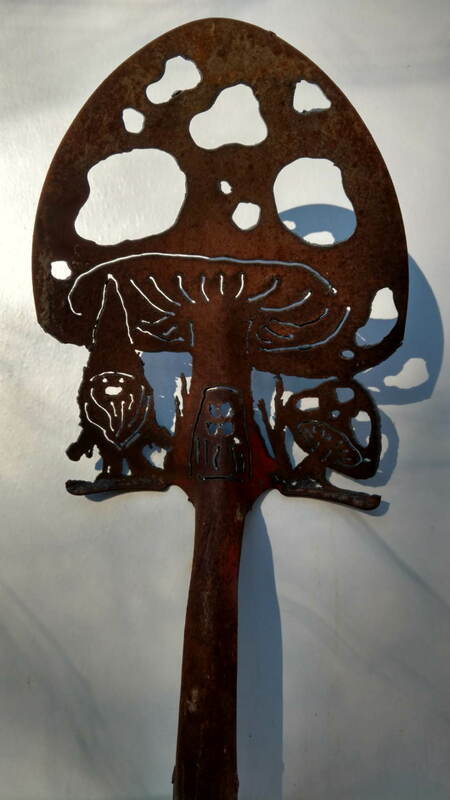 Gnome with mushroom home design hand-cut into a shovel with a plasma cutter. 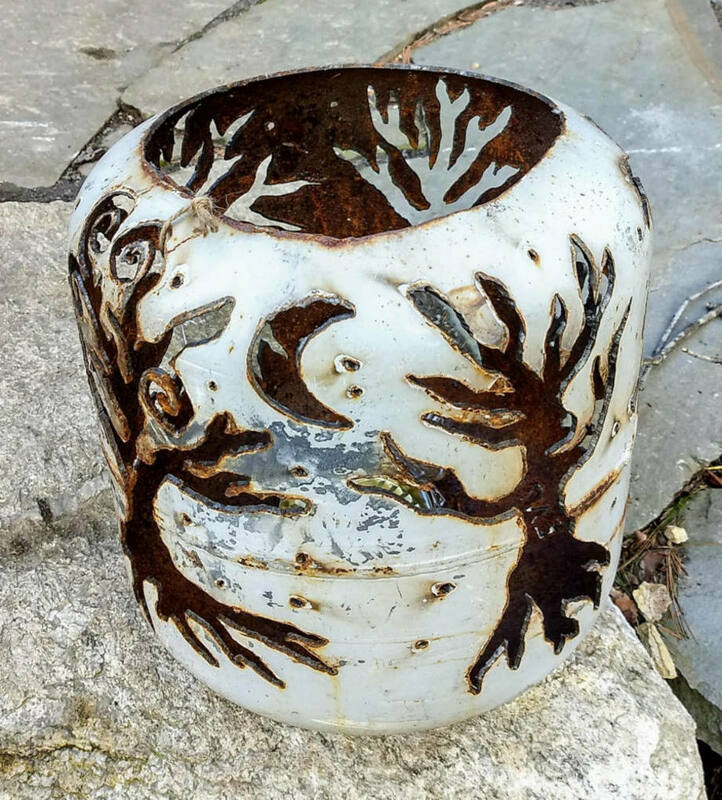 Steel, copper, and driftwood. 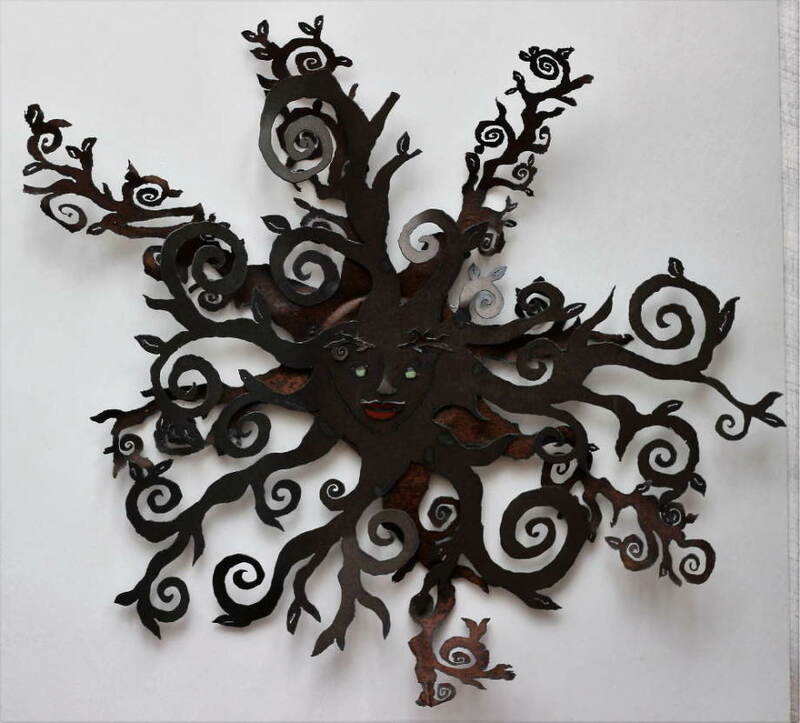 Design hand-cut in steel, painted and then combined with copper and wood pieces. Measures approx. 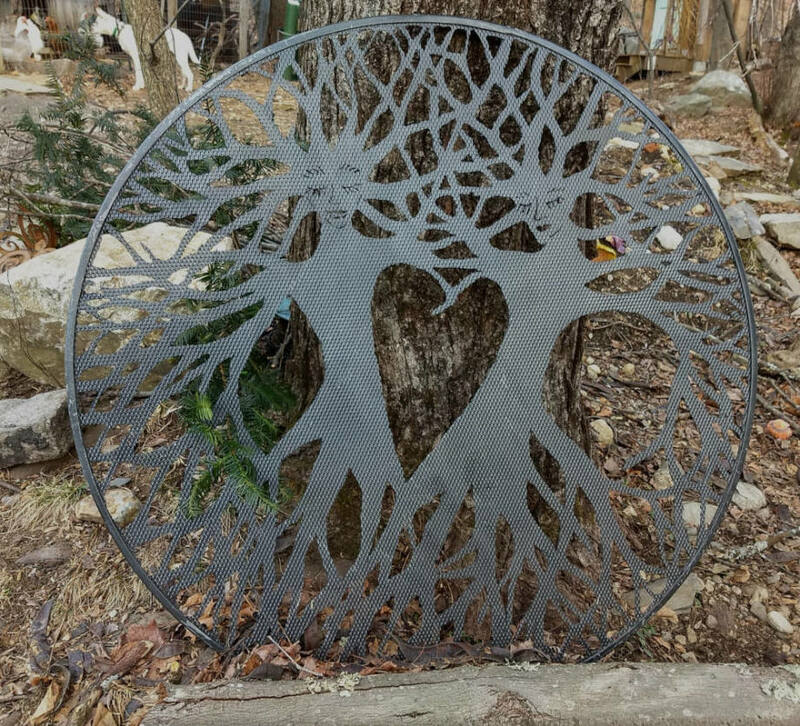 24" x 24"
Design hand cut into two pieces of steel and welded together. 39" diameter. Design hand-cut into an old rusty sign. Approximately 30" diameter. 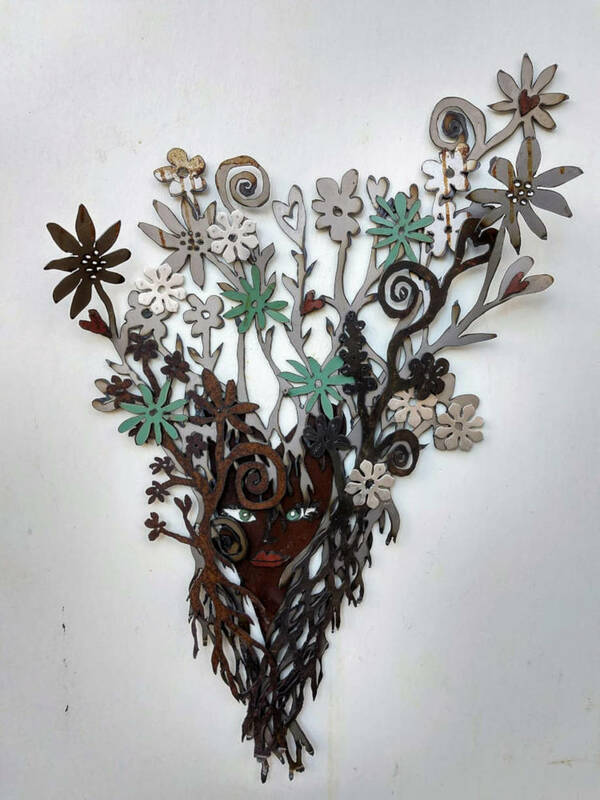 Hand-cut pieces of steel welded back together to form Mavis. She's apprximately 22" x 30" x 5". 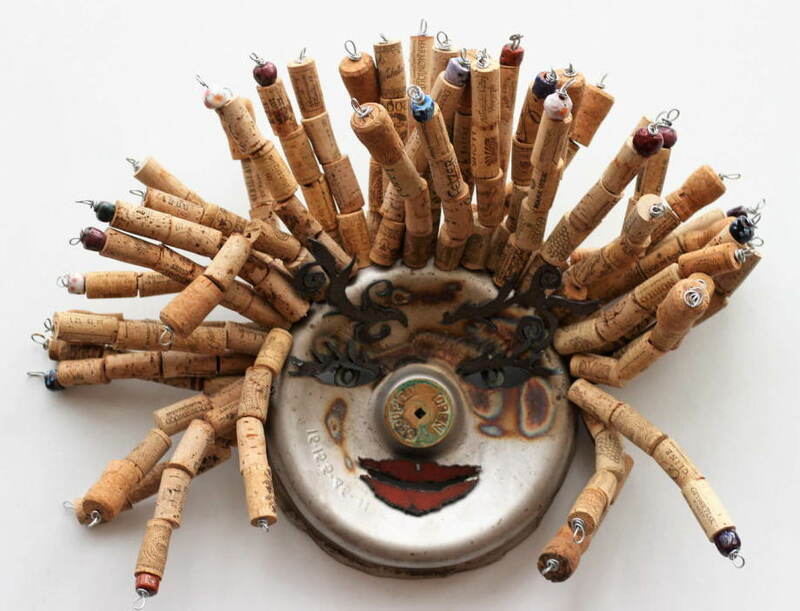 Created out of the top of a keg, Vivienne is a mix of wine cork dreads, hand-cut lips and eyes, and a "occupied/open" nose. 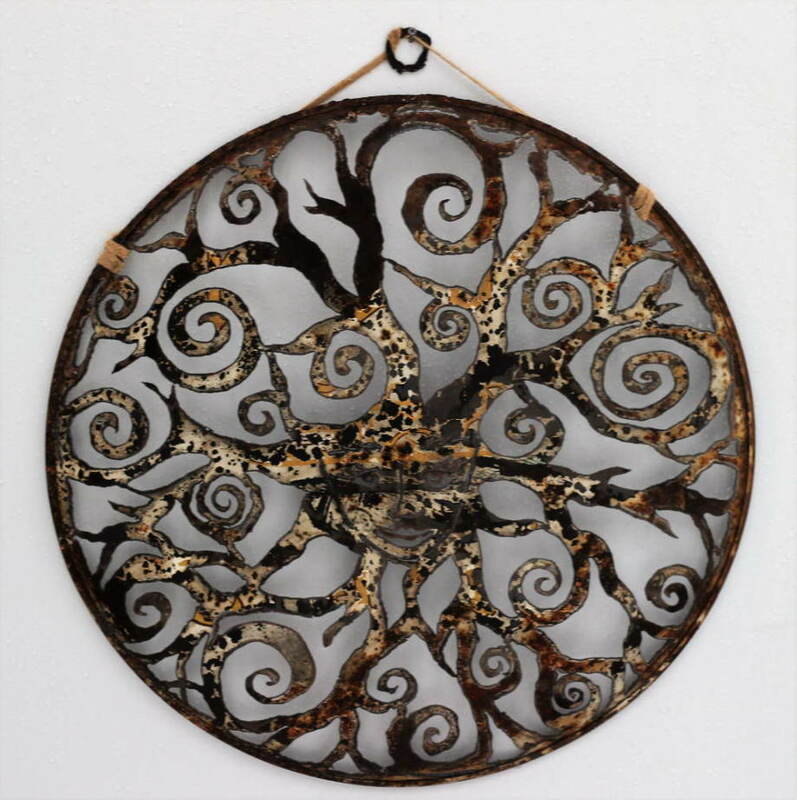 Measures approximately 24" x 24". 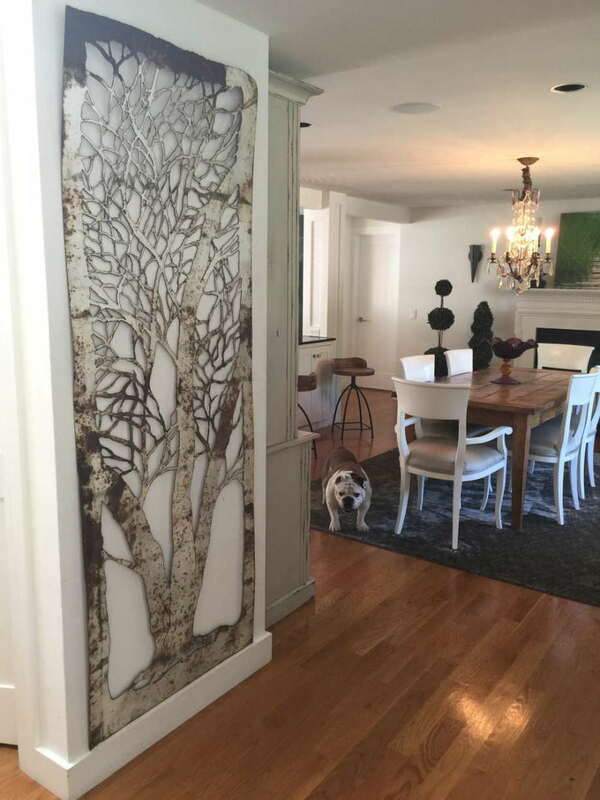 Birch hand-cut into metal panel. 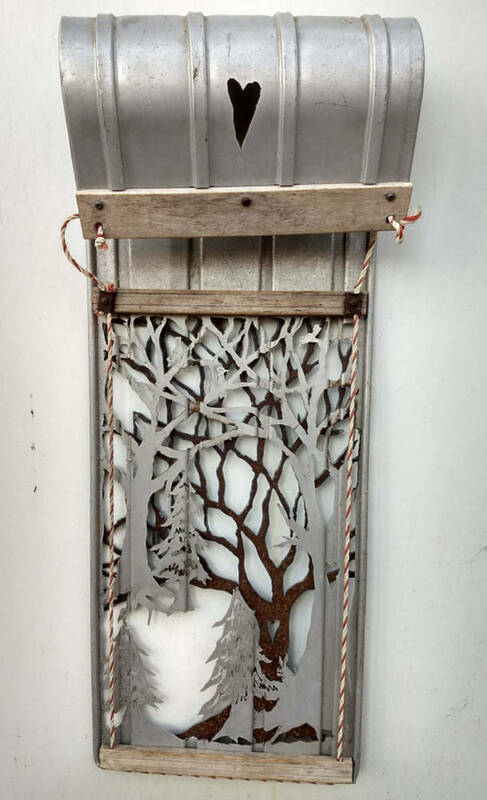 29" x 80". 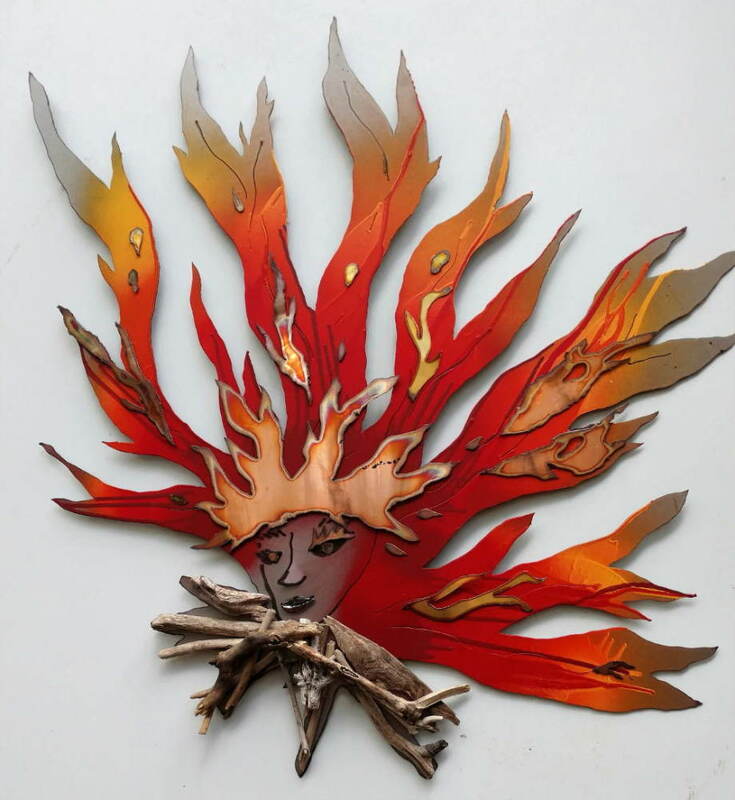 Four elements (Water, Earth, Air, Fire) depicted in an aluminum fan. 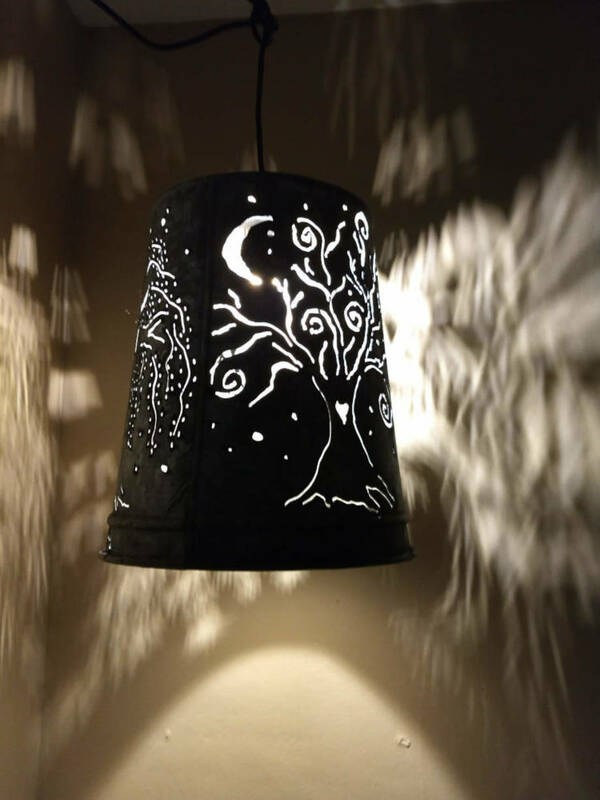 Hand-cut with a plasma cutter. Approx. 30" diameter. 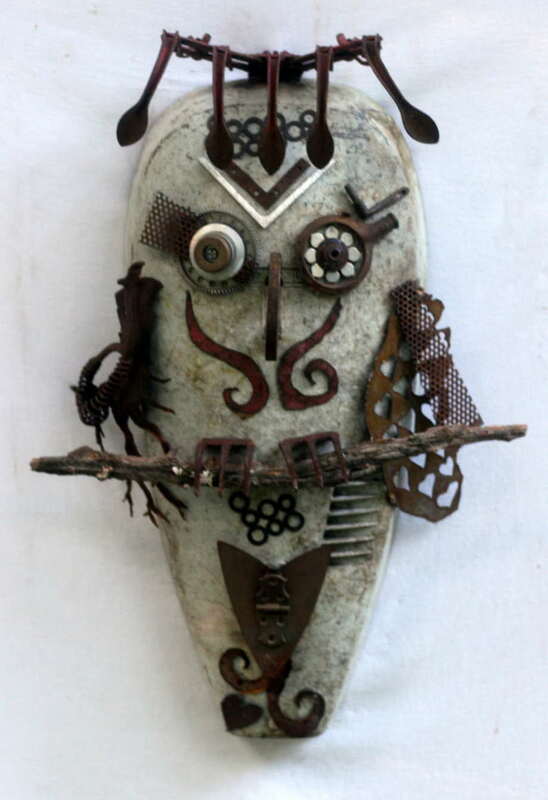 Mask created with found objects. 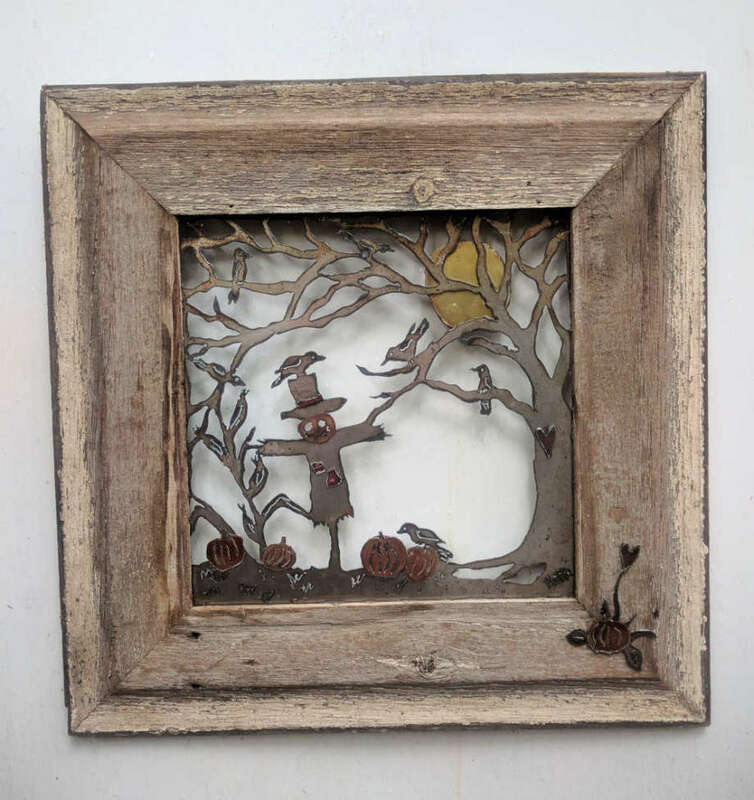 Measures approximately 26 x 26 x 4". 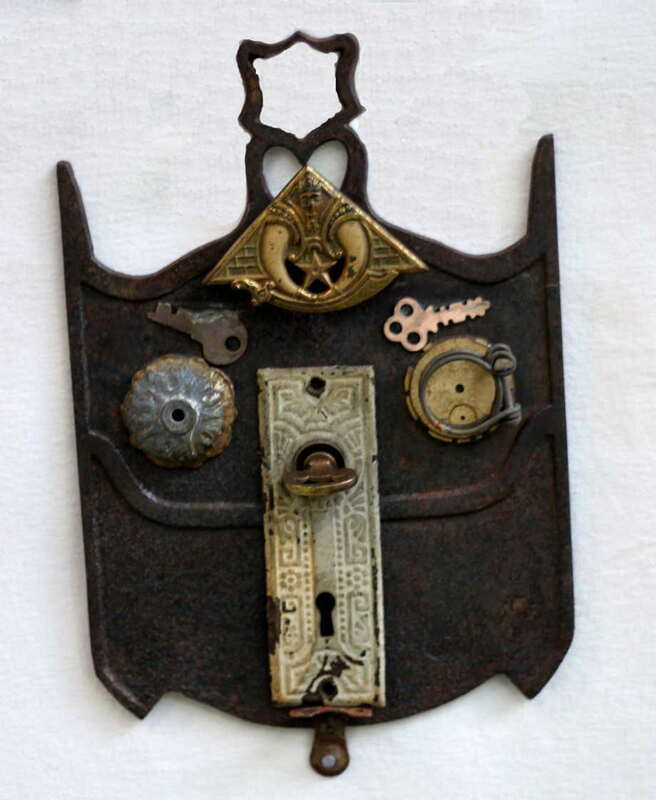 Mask created of found objects. Measures approx. 9 x 14". 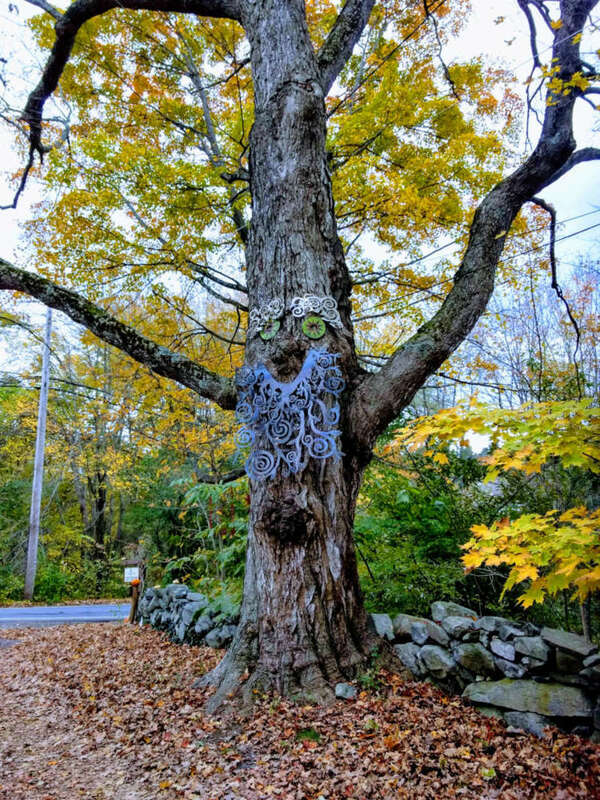 Found object sculpture of an owl, using an old street lamp as a base. Measures approx. 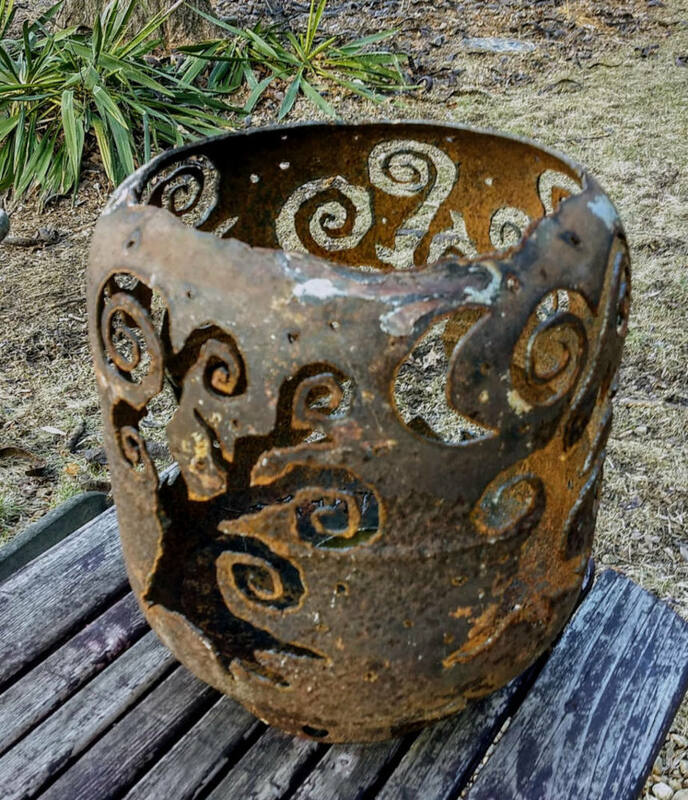 20 x 32 x 6"
Design hand-cut into a condemned, recycled propane tank with a plasma cutter. 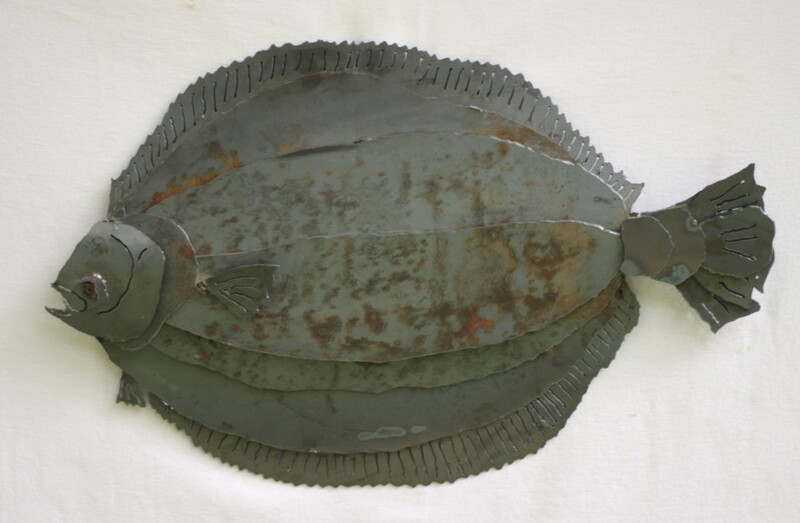 Fluke fish created by cutting pieces of steel and welding them together. Measures approx. 24" x 20".